Removal of these three items enables access to perform multiple maintenance tasks. Learning to do this safely and comfortably will come in handy down the road. All items can be removed with the under seat tool kit, if needed, but higher quality tools will make removal easier. You are responsible to take precautions to avoid any damages that occur during removal. Work slowly and deliberately. Please enlist the help of a mechanically inclined friend, neighbor or relative if uncomfortable and doing this the first time. Utilizing resources such as this post, service manual, and other sources is highly advisable. Gasoline is extremely flammable and can be explosive under certain conditions. Turn the ignition switch OFF. Do not smoke. Make sure the area is well ventilated and free from any source of flame or sparks; this includes any appliance with a pilot light. For California model, if gasoline, solvent, water or any other liquid enters the canister, the canister’s vapor absorbing capacity is greatly reduced. If the canister does become contaminated, replace it with a new one. Think ahead, tidy up before starting, assure an organized working environment. Determine safe, temporary storage spaces for your components in advance. This helps eliminate damages, misplaced fasteners, etc etc. As you are removing tank/seat/fairing, inspect (but don't disturb) and further identify the items you are uncovering. Consider this task a learning experience....and no doubt will be repeated for a great many service procedures....it'll become second nature! Start with the bike on center stand, flat, solid, stable ground. 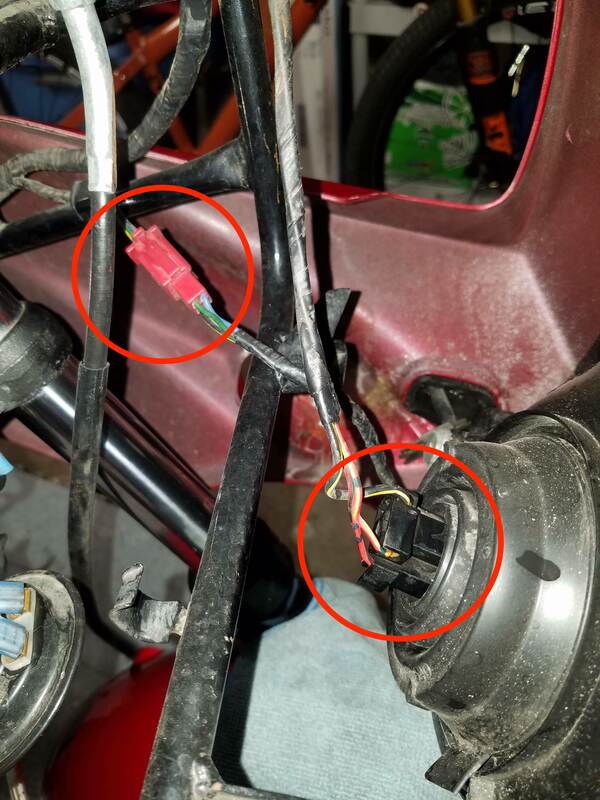 Remove seat by inserting key into rear lock, located in the rear drive side tail fairing. Turn key clockwise, seat should pop from lock, lift from rear and slide back. 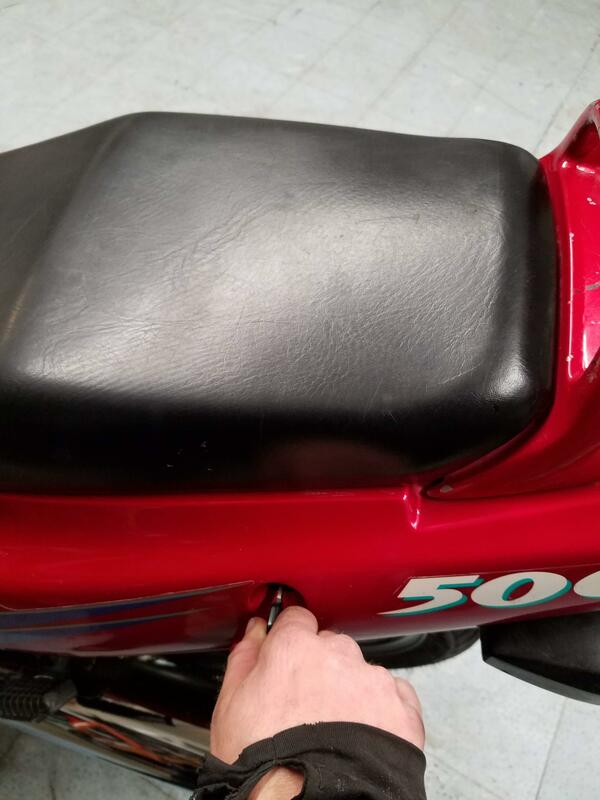 Store seat flat as not to bend front of seat away from tank. Remove the two phillips head screws located underneath the gas tank (one on each side). Remove the four 10mm nuts (two on each side) holding the mirrors. 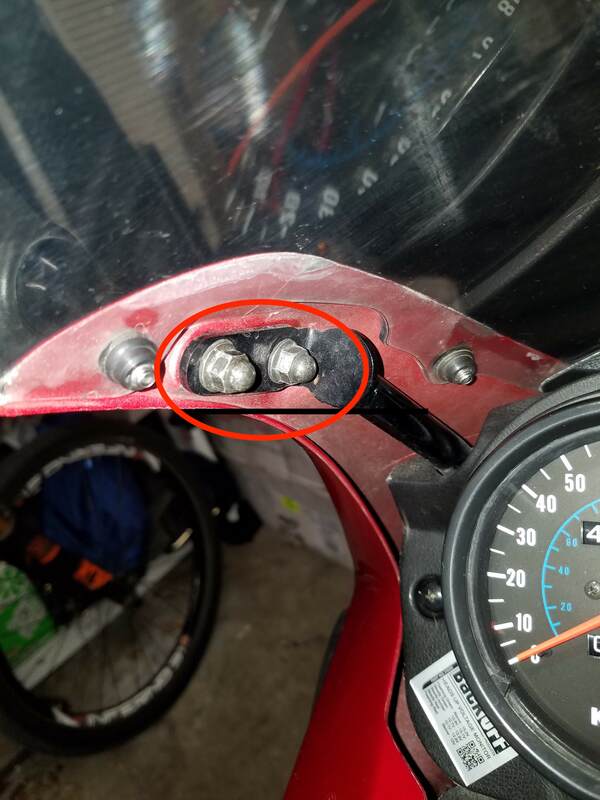 *Tip Place nuts back on studs, after removal, as not to loose fasteners. 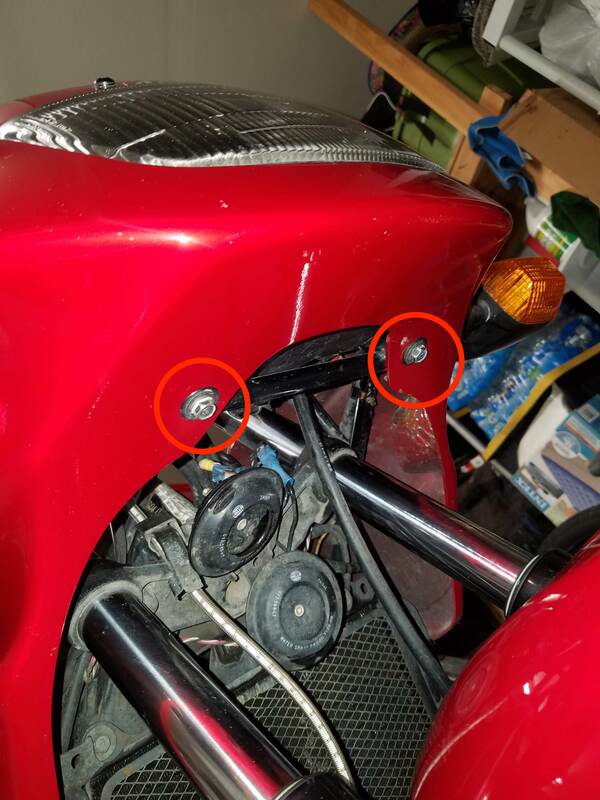 Remove two 10mm bolts on front of faring underneath headlight. 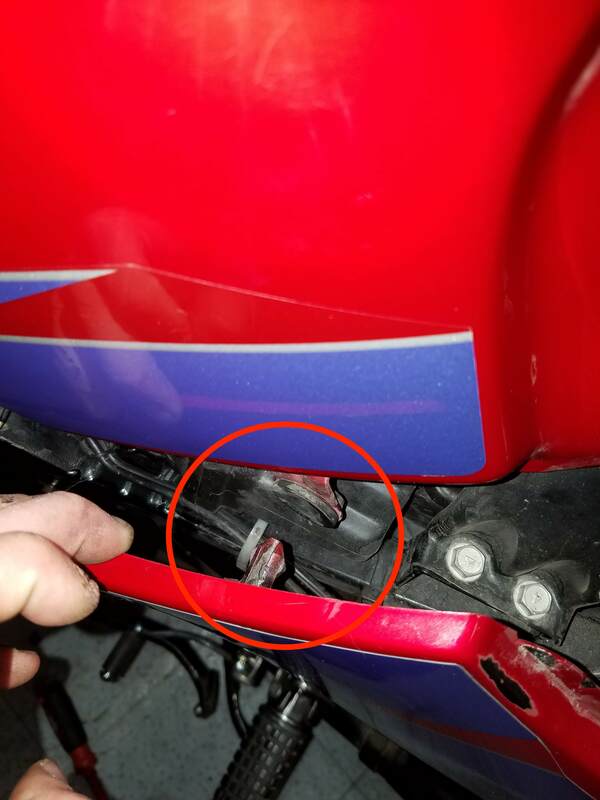 At this point the front fairing is almost free, before going any further set a clean small towel on the front fender, so scratching does not occur during removal. 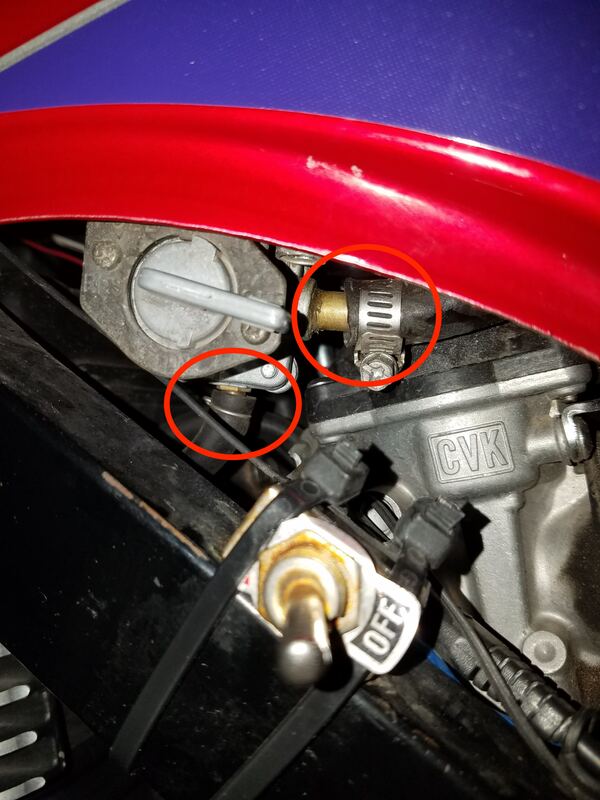 Carefully separate the fairing from the gas tank and mirror brackets, while gently pulling the whole fairing away from the bike. This will take time, be careful, you will get better with practice. Before pulling fairing completely off, set onto towel placed on the fender earlier or hold carefully. 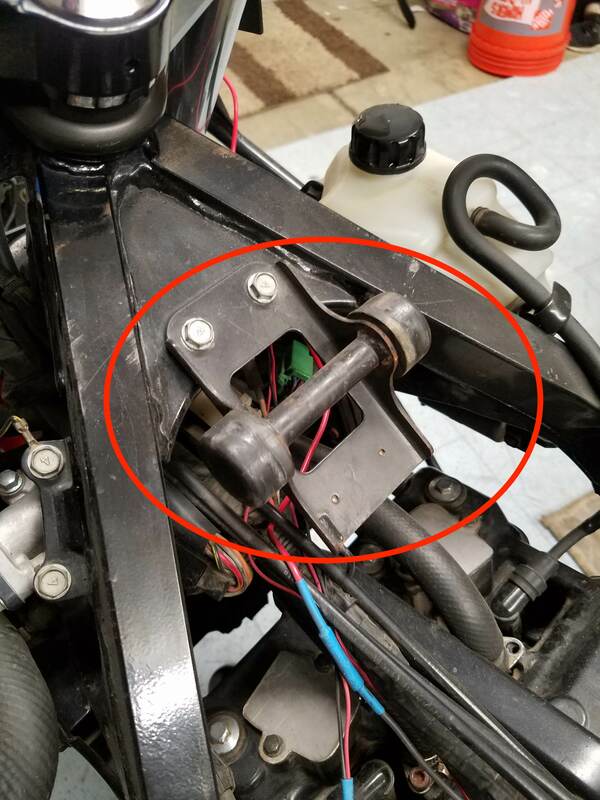 Locate the connectors pictured for the headlight/turn signals and separate them. 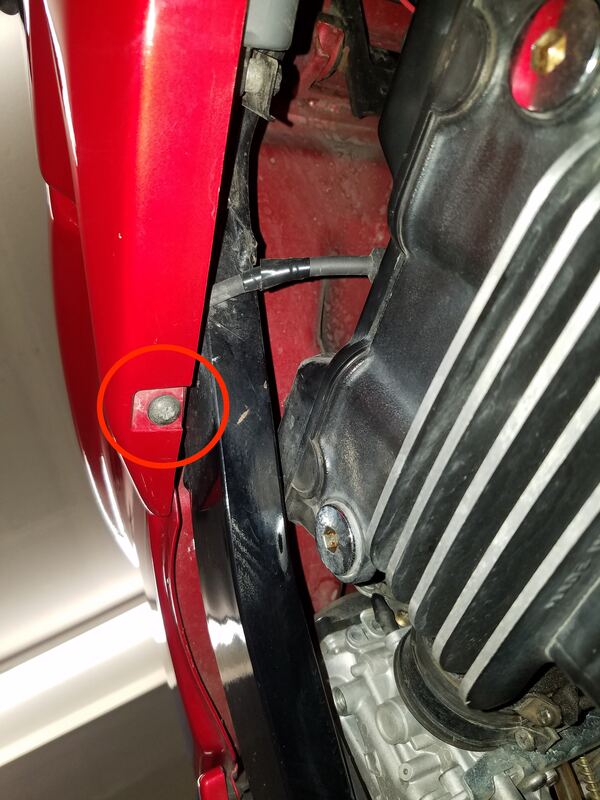 *Tip pull connecters apart at the base, locate any locking tabs, and never pull on wires. Now you can finish removing the front fairing and gently set on a clean/soft surface. Onto the tank, Remove the 12mm bolt and the rubber line from the backside of the fuel tank. Make sure petcock is in off position and remove the vacuum line underneath. *Fuel is dangerous please see warning at top of post! Then remove the fuel line pictured on the right, have a bottle or something ready to catch the fuel that will come out. California vehicles only* Breather and fuel return hoses must be disconnected from tank fittings before removal. Plug the fuel return fitting. This prevents fuel from entering the canister. The tank is free, gently separate from the frame by placing a hand at the front and back of the tank while lifting from the rear and pulling backwards. Place carefully on clean/soft surface, and do not drop. *Tank removal is always easier with an empty tank. Locate two rubber bushings pictured on frame, if these are cracked or deteriorated replace them. Sometimes these fall off during removal so check the top of your engine. Using super glue, or some other kind of bonding agent, apply to inside of bushing, slide onto posts, and let dry. For reinstallation follow the procedure in reverse. 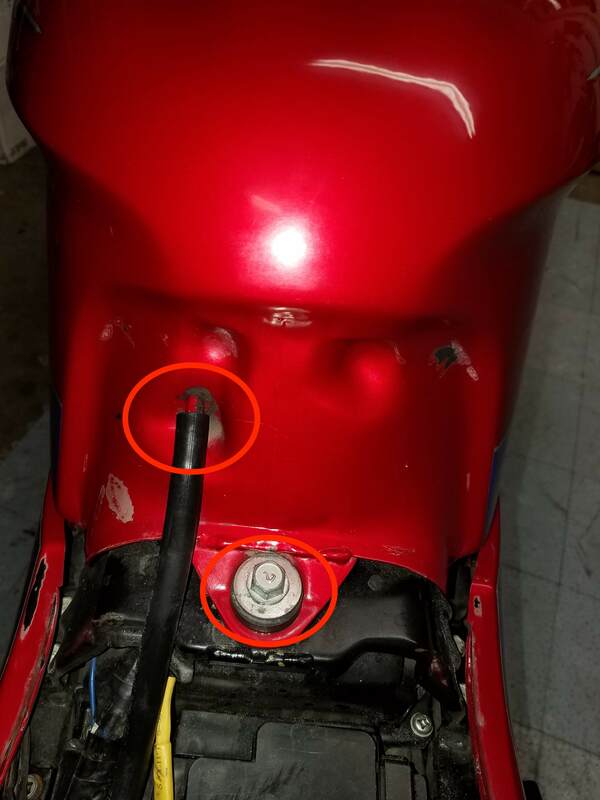 Be careful reinstalling front fairing/gas tank, take your time, do not force anything. Bolts are hand tight as not to rattle loose, but if you need a torque wrench, general guidelines per the service manual are 5mm Dia. threads get 3.4 - 4.9 N-m and 6mm Dia. threads get 5.9 - 7.8 N-m.
Congratulations! Much like raising the hood on the car.....you've now learned how to safely, properly access the battery, air filter, spark plugs, wires and caps, valve cover, carburetors, cables, various electrical connectors and components...inspection, maintenance and/or replacement of which will be covered in other areas of the forum. Stay safe and happy wrenching! Last edited by ksurk; 3-8-2019 at 1:02 AM.